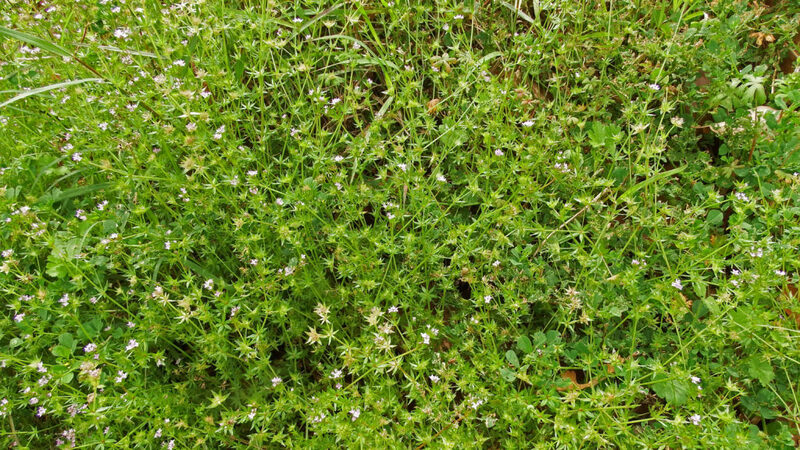 Field madder. Clustering waves of tiny blue flowers. Big spring arrives soon with fields of wildflowers buzzing with bees, birds migrating through, butterflies flitting hither and yon, and mosquitoes. That last one isn’t a delight, but reality is what it is. But before big spring gets here, you might take a moment to enjoy tiny spring. I should note that tiny spring is pretty tiny. The plants springing up all over the Park aren’t showy (except that field of bluebonnets and if you haven’t gone yet, what the heck are you waiting for?) and you probably think of them as weeds. But a weed is only a weed if nobody loves it and since I love tiny spring, there are no weeds in our Park right now. The entire weed category really does require reexamining. What is important about a flower? I suggest the most important thing about a flower is that it supports the insect life that pollinates our crops and thus feeds us. 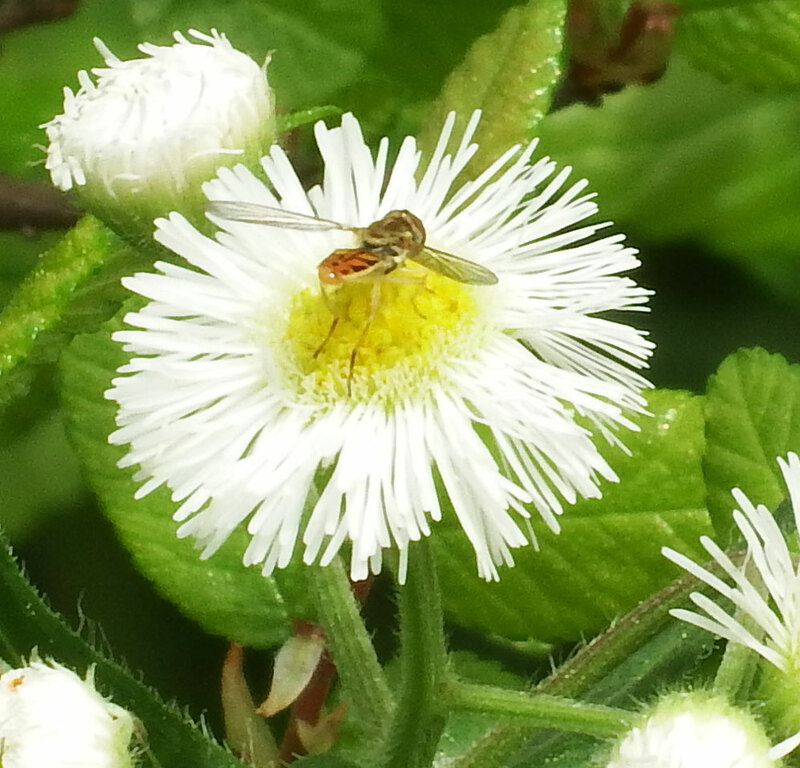 These tiny, unloved flowers are powerful pollinators and that’s probably because we have no interest in them. When we take an interest in a plant, we set about making it showier. We like showy. Insects like nectar and pollen and many of their larval precursors like leaves. 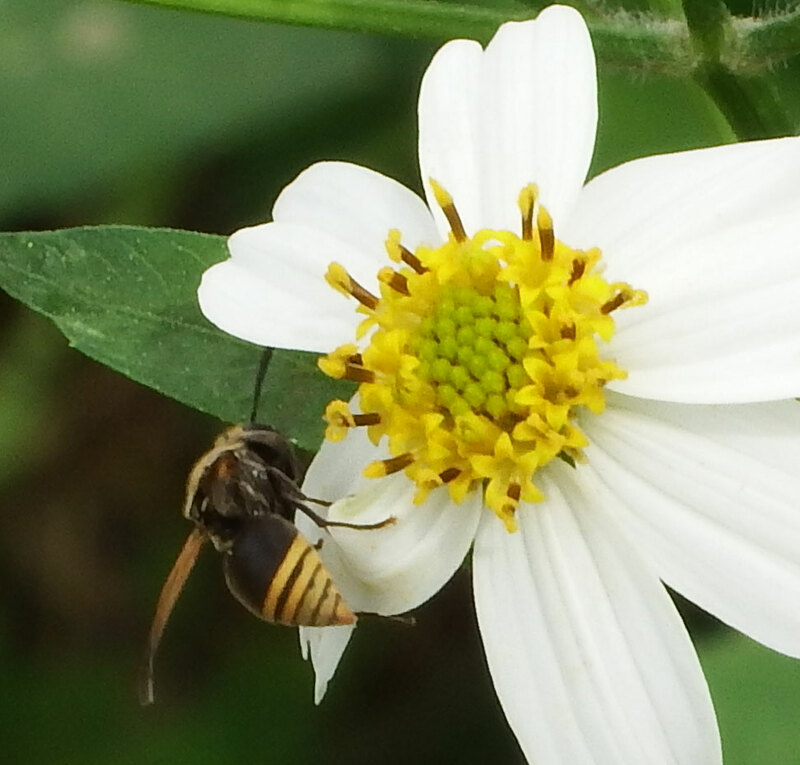 To find pollen and nectar, insects use guides we can’t see. There are probably many of them; we don’t know nearly enough about sensory input in insects. But we do know that many insects can see in the UV spectrum. What a plant looks like to a pollinator is often a literal bullseye around the tasty bits and pollen positively glitters. There can be stripes like a landing strip leading to nectar. When we set about creating a showy flower, we often accidentally eliminate the secret signals. How would we know, we can’t see them and don’t care about them. This is why you can see gardens full of beautiful flowers and practically no bees. They can’t find the pollen and nectar without a map. Unmarked flowers might as well be rocks to the insects who seek them. The weeds, however, are full of bees, and hover flies, and soldier flies, and beetles and all nature of flying and crawling things that will also, as the food chain keeps on truckin’, feed us! Tiny spring. Gotta love it. within about an hour spent communing with weeds. There are many, many more but I decided not to include the bees. Too obvious! 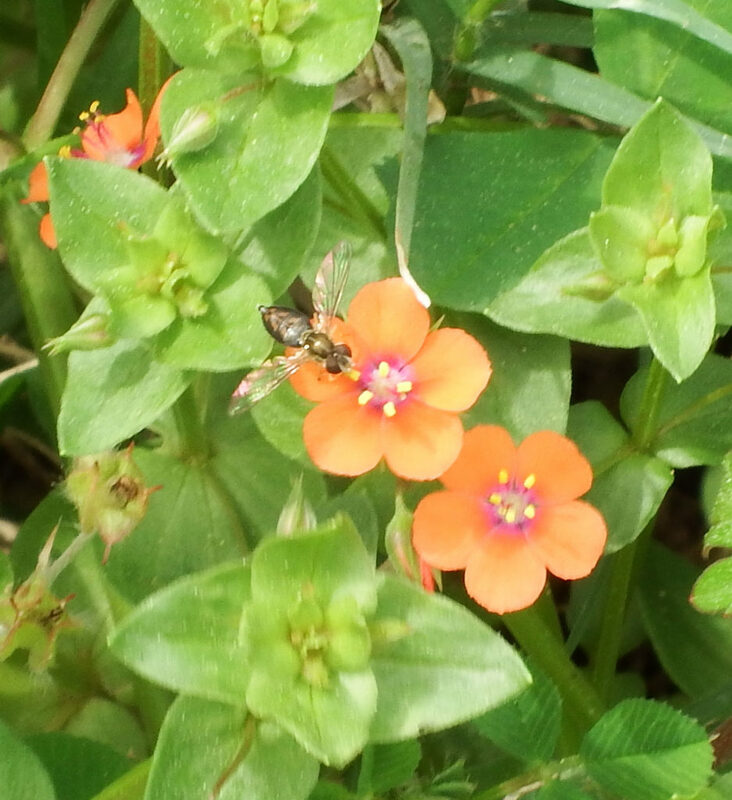 Margined calligrapher (the fly) on scarlet pimpernel (the flower). The flower is about a quarter inch across. 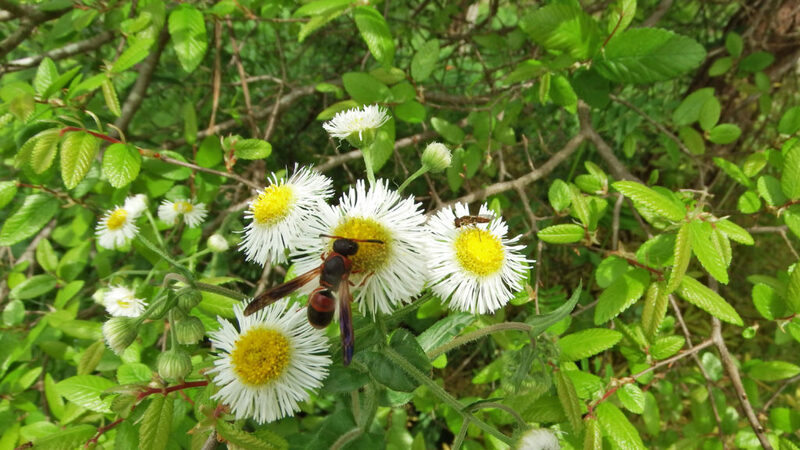 Mason wasp and hover fly on fleabane. 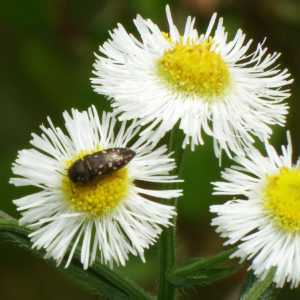 Fleabane is so named because we once believed the flowers could repel fleas. We should be so lucky, however the leaves are edible, but given how hairy they are, you would have to be a bit desperate. 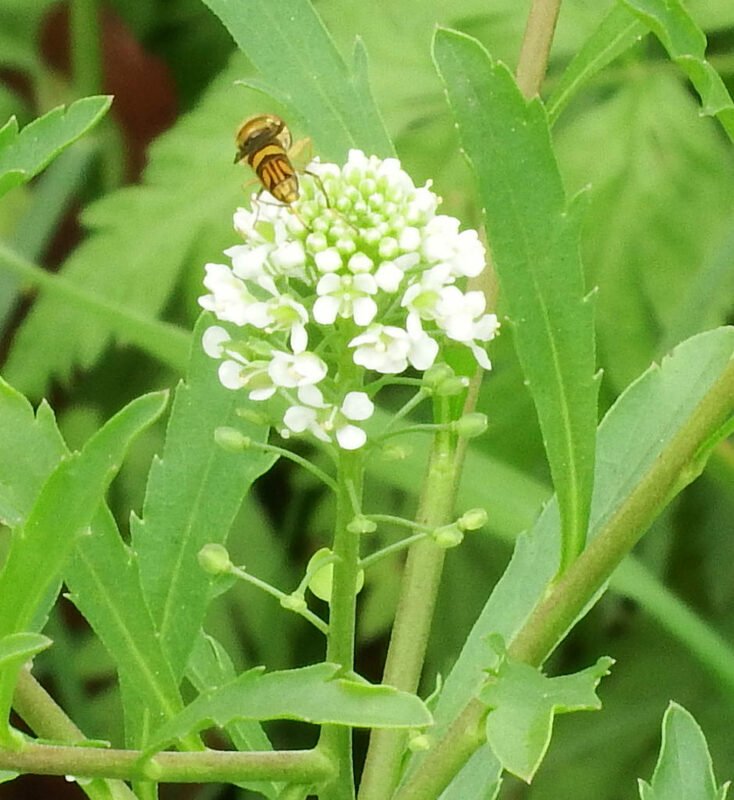 Oblique stripe tail hoverfly on Virginia pepperweed. 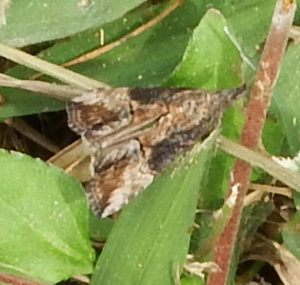 Snout moth. This guy was super fast. I can’t believe I got a photo. Metallic woodboring beetle that is apparently very difficult to identify for sure.